It’s official. The pop star, who recently wrote a track celebrating her friend Donatella Versace, is set to appear as the face of the brand for Spring-Summer 2014. Grammy Award-winning singer Lady Gaga has been photographed in London by Mert Alas and Marcus Piggott, for the Italian luxury label’s upcoming campaign. 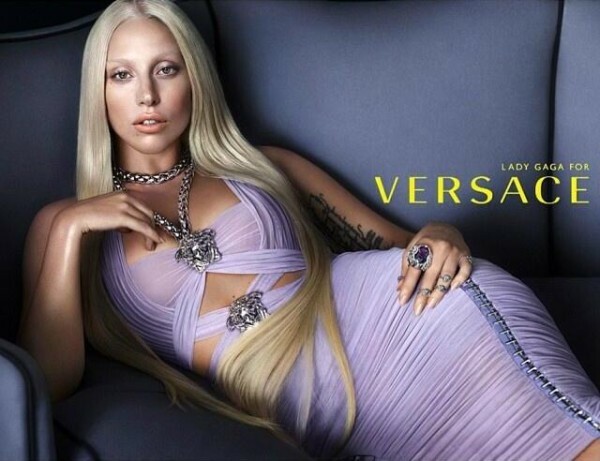 The gorgeous photograph released by Versace for the press, shows Lady Gaga putting on her best imitation of Donatella Versace in a lavender piece from the Spring 2014 Collection. The friendship between Donatella Versace and Lady Gaga started when Gaga borrowed a dress from the Versace archives for the “Edge of Glory” video. Versace even created the costumes for Gaga’s Born This Way Ball tour. The track “Donatella,” from Lady Gaga’s album “ARTPOP” was written to celebrate the 58-year-old designer.